Roj Khordad Mah Bahman, 1382 Yz. Parsis, in general, are well-meaning, decent and civilized people. They feel for their religion, even though they may not know much about it, and may be practicing very little of it. But sometimes, the ignorance of Parsis towards even the most basic tenets of their religion results in their making glaring and farcical mistakes. Take for the instance, the total ignorance amongst most Parsis about the most basic sin (and spiritual repercussions) of moving around barefoot. This ignorance is most visible in our Agiaries where scores of Parsis move around barefooted, carrying Divas from here to there. But sometimes, there arise situations, especially when other communities or the general public is concerned, where Parsis commit the cardinal sin of making an unnatural and unholy show of their religion. Our Master, Ustad Saheb Behramshah Nowroji Shroff explained that the practice of religion is a very personal and confidential matter. It must be kept very private and away from any public displays. Praying loudly in Agiaries, disturbing other devotees, drawing unnecessary attention by clapping loudly or snapping the fingers incessantly, bowing and genuflecting more than required in front of the Padshah, bowing done in front of the Padshah and monopolizing the threshold (umber) of the Padshah Saheb’s Kebla, are all acts which fall in this category. In public, in front of members of other communities, Parsis suddenly become more pious and holy. Performing Kusti in public places, praying in front of the sea despite the presence of non-Parsis very close by, and of course, the old favourite, visiting places of worship of other religions, are all cardinal errors. Now these may seem small and inconsequential things to many of my readers. But once in a while, someone comes around and does something so totally senseless that it needs to be brought to the notice of the community. I refer to a recent event – the inauguration of Della Resorts – a venture of young Parsi entrepreneur and BPP Trustee Mr. Jimmy Mistry at Lonavala on Saturday, June 15 2013. I am all for Parsis having the entrepreneurial streak and blazing new trails in all types of business. It is what made our community rise to the pinnacle during the last 300 years. I am all for Parsi entrepreneurs flashing their Parsi-panu, rather than hiding it. I am all for highlighting our glorious Iranian heritage and history. But all this has to be done in moderation, it has to be done with finesse, a finesse which comes with good education, proper upbringing and core values. When it goes over the top, when the connections become tedious, when the comparisons seemed forced, the drama degenerates into a farce. And this is what has happened in the case of Della Resorts. An invitation for the inauguration mentioned the various events of the evening, which were to culminate in a fashionable cocktail and dinner at the ‘Yatha Ahu Varyo’ Ballroom! WHAT??? I blinked a couple of times and re-read the invite. There was no mistake. Cocktails and dinner was to be served at the ‘Yatha Ahu Varyo’ Ballroom 9:30 pm onwards. What is the connection between Yatha Ahu Vairyo and a ballroom? Going over the Della Resorts website, I finally found the connection (or at least I think this is the connection). You see the ballroom is very big, so big that it can be broken into three parts and used separately. Alternately it can be combined for one big event. This esoteric significance was at once caught by the young entrepreneur and in his mind, maybe it fitted perfectly with the three separate words of the sacred chant which is also referred to by pious Parsis in one word as ‘Yathauvairyo’. How ingenious! How captivating! How sweet! HOW PROFANE! HOW RIDICULOUS! HOW NAUSEATING! 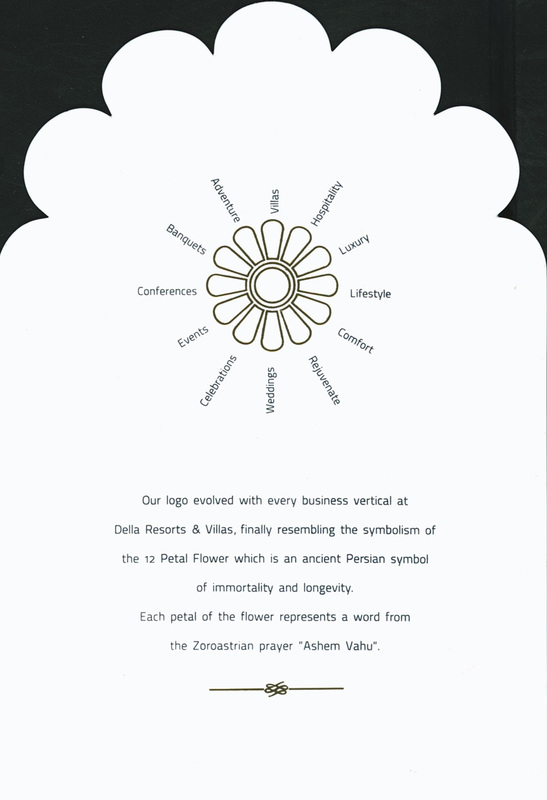 So not content with appropriating the name of the most sacred prayer of the Avesta – the Yatha Ahu Vairyo – and using it to name a ballroom, Mr. Mistry also appropriates the ancient flower symbol of the Zoroastrian Kings of old, ascribes the 12 petals to the 12 words of the Ashem Vohu, and then goes on to ascribe each of the 12 petals to 12 different ventures of his: Villas, Hospitality, Luxury, Lifestyle, Comfort, Rejuvenate, Weddings, Celebrations, Events, Conferences, Banquets, and Adventure. I spent the better part of the day trying to fit the jigsaw: was Ashem a villa, or was it adventure? Was Vohu comfort or adventure? Ashem comes at the beginning and at the end of the chant, so which two activities of the group mean the same? Maybe wedding and celebration mean the same? Oh, this was so much better and mysterious than a Dan Brown novel! Move over da Vinci, we have our own da Mistry! Hah! Way to go, young man! In all my years of study of Avesta and Pahlavi and Khshnoom I could not conjure up such esoteric constructs! JUST WHAT IS GOING ON? Is there no end to frivolousness? Are our sacred chants to be used, misused and abused in this manner? Is there any one with brains in the group advising this man? Do they not have proof readers? Can they not get even the name of the sacred chants right? Is it Varyo or Vairyo? (Someone must have realized the goof up, because the website spells it correctly) Is it Ashem Vahu or Ashem Vohu? Readers of Frashogard, our community is hurtling down the road to self-destruction. There is so much of artificiality, so much superficiality, so much of pretence and make-believe that it is actually wonder we are still surviving. One by one, we are giving up all the icons of our faith. We bid adieu to wearing the Sudreh Kusti at weddings and Navjotes decades ago, we bid adieu to our Tarikats even earlier. We gave up on daily prayers and visits to the Agiaries, we gave up on our Dakhmas enough to suggest that we should build a crematorium on Dungerwadi lands, we gave up on our unique ethnic identity to allow ‘mixed marriages’ to take place in our Baugs, we gave up the great Zoroastrian credo of speaking the truth , at all times, to become entrepreneurs by cheating and bribery, we gave up our stupendous charity, to become those who lie and apply at multiple Trusts to steal what rightly belongs to another. What is left for us now? This kind of fake, shallow breast-thumping? Is this what Parsi-panu is all about? Naming a ballroom after the Ahunavar? What next? Some of my readers may ask why I am complaining so much. Wasn’t there, in old times, a Parsi Moholla called Yatha-Ahu-Vairyo near Bhendi Bazaar? Are there not many businesses named Mazda and Ahura? Yes, there was a Moholla called Yatha Ahu Vairyo Moholla (there was even a surname called Yatha Ahu Vairyo amongst the Mobeds of Navsari), but those were unique Parsi things. What is so Parsi about a ballroom? What is so Parsi about villas and adventures that they have to be compared to the words of the Ashem Vohu? Nothing. But there is a deeper meaning here and that is why I am protesting so much. Our revered Master, Ustad Saheb explained that the basis of the whole Avesta (and indeed the entire Universe) is the Divine Science of Stoat Yasna. Each and every word of the Avesta is sacred. It cannot be used in vain. It cannot be taken out and mended. It cannot be joined into a mish mash of things. Not one Avesta word can be uttered in a state of uncleanliness. (even though the Yatha, Ashem and Yenghe Hatam are Azad Manthra). There are severe Karmic laws that come into effect when the sacred words of God are misused, abused or even mis-pronounced. Not one word of the Avesta can be wasted or uttered in vain. This is the very reason why we should not write Avesta words on invitation cards, new year cards or make stickers to put on cars. This is why we have a very strict regimen as to how to dispose of old Khordeh Avesta books, manuscripts and religious items. How does one explain these things to persons so lost in materialism and senseless self-aggrandisement? How do we approach these high and mighty and explain to them the folly of their behaviour? How do we convince them of their futility and nonsensicality? All we can do is pray one Ashem Vohu silently and pass the thought that the personal Khuda of this young man may bring him to his senses and soften the great Karmic backlash which will come, sooner or later, but come it will, without fail. Your readers will never ask why you are complaining. Parsis taught me respect for elders, prayer and rituals are important, and above all they taught me there is no substitute for a good education. I am not a Parsi but had the privilege to train at Parsee general hospital 20 yrs ago…years that I treasure. May their tribe increase. Everything here is “Agithu che ” “Chokhhu ” karta vakhat lakhse . I am sure this sort of Postings will definitely help our community in future. Amin . kersi k kapadia. Thank you for your guidance Dasturji Saheb. How would you define the Karmic backlash you are so sure about. When tragedy takes place to those you have cursed and bad mouthed, is that divine backlash you are waiting for, is that proof enough of your Ustad’s teachings? What would you call when tragic events come calling upon you personally and all those who have been pious throughout? Grace of God? Just give it a serious thought, before you decide to bless me in anyway…….. Absolutely right…..”FANTASTIC”…. you forgot 1 more thing. Naming children from 101 Names and then in parsi panu we use MC/BC while calling them. For example, if a guy was named Hormazd, then in a parsi accent “Aye BC Hormazd haiyan aavne chu…”. Why did you forget this? The Priests while reciting Yatha,”in the middle of the verse, the word Hyat-a-shai”, they speak Yadashai, Have you noticed? When I exploited such actions on Yahoo forum, they banned me out. The ashofarah stickers on cars where dogs pee on the tyres, have the parsis known that? The Diva box with ashofarah and astash pictures are thrown in garbage. Parsis, Do you do that?, If you do it then stop it, it will bring disharmony in your life. Knowingly or unknowingly, stop doing it. We can request the manufacturers to stop printing these on articles which require disposing off. Your questions about Karmic backlash and what to do when tragedy strikes have been adequately explained in the series of posts “How to deal with a Tragedy” [http://www.frashogard.com/how-to-come-to-terms-with-a-tragedy-part-1] Contrary to what you say I have not cursed or bad mouthed anybody, I have merely highlighted the spiritual error of their actions. Nor am I wishing hell for others and expecting the reward of Heaven for myself. Please read the article carefully. I have in fact appealed to God to soften the blow. As a priest, I consider it my duty to bring to notice the mistakes committed, knowingly or unknowingly by a fellow Parsi. The idea is to educate, not to denigrate. The denigration is done by those whose frivolous behaviour is hurtful to my sentiments and the sentiments of many fellow Parsis. If you feel otherwise, it’s OK. I have no power to bless or curse you. But I do have the ability to request God to bless you, which I will, whether you agree with me or not. Thanks for commenting. Not one Avesta word can be uttered in a state of uncleanliness. (even though the Yatha, Ashem and Yenghe Hatam are Azad Manthra). Can you please inform, as can we pray the Azad Manthras even if the head is not covered or while daily travelling. While I fully agree with Ervad Hathiram about etiquette to be observed by a Behdin in a Agiary, but this praying loudly in agiaries should not be misinterpreted by others. If a behdin is praying, he is praying for himself, so it should be kept at his personal level, whereas Mobed is authorized to pray loudly with his sonorous voice, for he is conducting the kriya for others. Most people think and act out of ignorance and it is obvious that Jimmy in this particular instance is no exception. It is said, that when God wishes to destroy someone HE clouds their thinking and the inevitable destruction follows but then Jimmy is extremely fortunate that he has none other than you to correct him. Imagine a non Zarthosti invitee trying to mouth the words YAV in seeking directions to the banquet hall thereby unknowingly reciting part of the manthra which is meant to be recited by Zoroastrians only. I hope good sense prevails and that he rectifies the error or this could well be his Waterloo! Across a whole page by not only Paris but non Paris, such as certain jewellers such as Narottamdas. I feel both Parsi Times & Jame Jamshed should follow a policy of not allowing these pics in their ads. Whenever these papers are disposed off, the pics go along with them and one never knows, they may land on the road with all tramping on it or be used for wrapping just about anything. It’s most painful to see this happening. Am intending to write to both but wonder how it will be read and whether it will be acted upon. I just posted a comment but forgot to tick about notifying me of any posts or comments to my comment above.